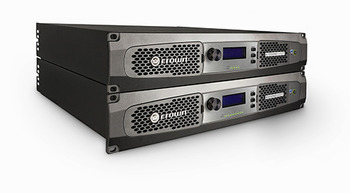 ELKHART, Indiana — HARMAN’s Crown Audio today announced it is expanding its DriveCore Install (DCi) Series amplifier range with the introduction of its DCi Network Display 8|600ND and 4|1250ND power amplifiers, featuring front-panel status displays and AVB (Audio Video Bridging) connectivity. The new eight- and four-channel DCi Network Display amplifiers will be the first professional audio amplifier to be certified by the AVnu Alliance. DCi Network Display amplifiers will deliver reliable audio performance and networked operation in AVB-based audio/video systems. “Since their recent introduction our Crown DCi Series amplifiers have set a new standard for installed sound, and our new DCI Network Display amplifiers build upon this industry-leading performance by offering certifiable compatibility with AVB-based installations, along with easy setup and operation and unshakable reliability. Combining DriveCore technology with AVB represents another first from Crown as we continue to lead the way for professional amplifier innovation for the most demanding large-scale environments,” said Daniel Saenz, Business Segement Manager, Crown Audio. Both DCi Network Display amplifiers feature a front-panel display and LED indicators that provide at-a-glance indication of key parameters. A large multifunction knob and push buttons enable instant access to control functions. The amplifiers are compatible with HARMAN’s HiQnet Audio Architect™ system setup and control software and utilize TCP/IP-based protocol in HiQnet for network monitoring and control. The eight-channel DCi 8|600ND delivers 600W into 8 ohms (300, 600 and 300W into 16, 4 and 2 ohms) and the four-channel DCi 4|1250ND provides 1250W into 8, 4 or 2 ohms (625W into 16 ohms). Both amplifiers offer direct drive “constant voltage” capabilities for 70Vrms and 100Vrms amplification without the need for a step-up transformer, yielding higher audio quality in distributed audio applications with power outputs of 1250W and 600W respectively. Like all Crown DCi Series amplifiers, the DCi 8|600ND and DCi 4|1250ND utilize HARMAN’s proprietary DriveCore amplifier IC chip for powerful, highly efficient operation from a compact form factor measuring just 2 RU high. The DriveCore chip combines the amplifier driver stage into the power output stage along with additional audio-signal functions, yet is about the size of a postage stamp. The DriveCore-based Class D, next-generation PWM design dramatically reduces size and power consumption and yields much more energy-efficient operation. Both amplifiers provide a host of networking and control features to ensure reliable operation, including continuous load monitoring, comprehensive error reporting, pilot tone monitoring and programmable general purpose input/output (GPIO) ports. The DCi 8|600ND and DCi 4|1250ND offer extensive DSP capabilities such as LevelMAX™ limiters for the inputs and outputs, with thermal limiting, input and output delay, input and output EQ, built-in crossovers and a built-in signal generator. The amplifiers incorporate an exclusive Power Factor Corrected (PFC) universal power supply that is designed to deliver maximum power in any country and their universal AC input accepts voltages from 100 – 240 VAC, 50/60Hz (+/- 10%). A newly-designed cooling system focuses the airflow on where it’s needed most, yielding maximum efficiency even under demanding operational conditions.